Remember how I have bad luck with rental cars. Well, it continues. It went a little something like this. As I approach the kiosk to pick up my rental car, the agent approached me with, "We are out of compact cars, but are pleased to offer you a free upgrade. Right this way." 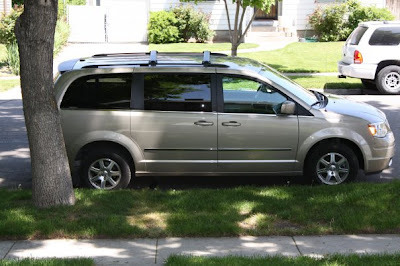 She walked me over to a mini van...a soccer mom, backseat fold down mini van. HAHA!! I am not laughing at you...but man, you do have some bad rental car luck. I think I would have preferred the yellow sports car.